"Virus Epidemics with Special Emphasis on HIV and AIDS: Reflections on the Past and Prospects for the Future"
Few scientists have earned the fame of Robert C. Gallo, MD, co-discoverer of HIV as the cause of AIDS, pioneer of the HIV screening test, and the first to identify that HIV/AIDS infections are slowed by immune system compounds called chemokines. Gallo will deliver the Raymond Schinazi Distinguished Lecture on Thursday, Sept. 1, 2016 at 4 p.m. in Emory University's Health Sciences Research Building Auditorium at 1760 Haygood Drive, Atlanta, GA 30322. The lecture will be followed by light refreshments and a concert performance at 5:30 p.m. by the Vega String Quartet, Quartet in Residence at Emory University. The lecture is free and open to the public, with no RSVP required. It is co-sponsored by the Pediatric Center at Emory University and Children's Healthcare of Atlanta and by the Emory Center for AIDS Research. 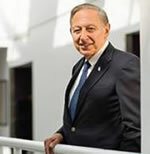 Gallo is the Homer & Martha Gudelsky Distinguished Professor in Medicine and founding director of the Institute of Human Virology (IHV) at the University of Maryland School of Medicine and co-founder and scientific director of the Global Virus Network. Gallo will present reflections on the past and areas where we might have done better. He will discuss the great contributions in the field of HIV research and where we are today as well as a view of the key problems for the future. Gallo will provide background on the special aspects of this kind of virus, namely a retrovirus, and his earlier discovery of the first known human retroviruses, human T cell leukemia virus-1, or HTLV-1, as well as HTLV-2. He will end his lecture by describing the direction in which research is headed, the Institute of Human Virology's HIV vaccine, including where it is today (phase 1 human clinical trials) and the difficulties facing the field in the future. Gallo's work enabled physicians to diagnose HIV/AIDS more quickly, protect patients receiving blood transfusions and prolong the lives of those infected with the disease. It also transformed how the scientific and medical communities think about the cause, prevention and treatment of cancer and herpes. Thirty years after his discoveries revolutionized HIV/AIDS research and treatment, still chief among Gallo's pursuits is finding a cure and a vaccine for the deadly disease and putting an end to the AIDS pandemic. This led him to establish the IHV, the first U.S. center to combine research, patient care and prevention programs in an effort to accelerate the pace of progress. The institute also researches hepatitis C, herpes, and virus-associated cancers. Its unique multi-disciplinary approach allows IHV's 70-plus scientists to fast-track research from concept to clinical trials. Since its founding, the institute has been credited with several discoveries, 21 of which have been awarded patents. In 2011 Gallo co-founded the Global Virus Network, a one-of-a-kind coalition of the world's best medical virologists working together to better understand the viruses that kill millions of people each year, to develop therapies and vaccines to prevent illness and death, and to defend the global community against new viral pandemic threats.